My boss has this giant monster plant growing in his yard and none of us knowwhat it is. 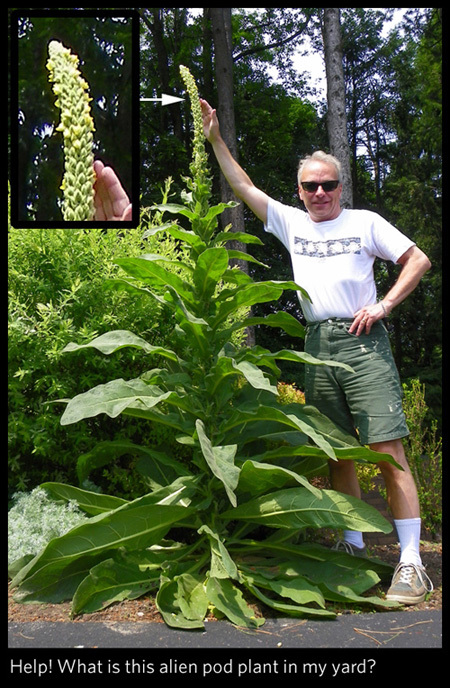 He thought at first it was lambs ear 'cause it had soft leaves but it has grown like crazy and is now two feet taller than it is in the picture! Anyone out there have any ideas? UPDATE: It appears that it is a Common Mullein aka Wooly Mullein. Actually it has lots of names. Here is sounds pleasant... here it sounds like a menace! Have you tried contacting the Cornell Cooperative Extension? looks like a triffid to me. You better keep a close eye on it and get ready to run away! it is lambs ear or Mullien - it's a biennial so this is what it looks like in second year when it blooms.